If ‘Harold’ was a real guy, I’d want to know him. 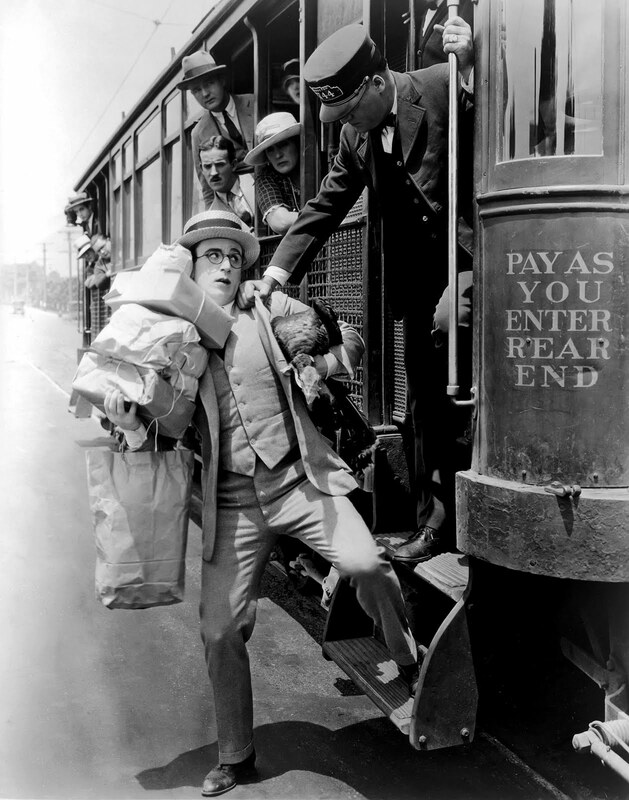 I’d want to know the man behind him, Harold Lloyd, too; but for different reasons. 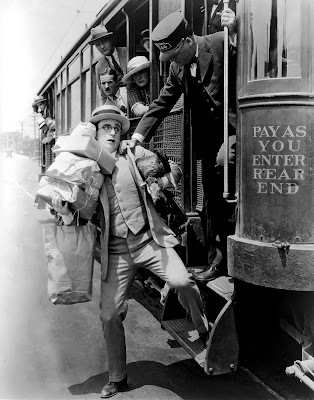 Harold Lloyd, comedy megastar of the silent era, was one of the few to survive it with career and lifestyle intact; he’d have a lot of good stories to tell. But ‘Harold,’ his character in Hot Water, is someone I’d want for a friend even if he amounted to nothing. He’s a simple, gentle, genuine man I could trust. A flawed man, though. Here’s the best example: Near the end of Hot Water’s first sequence of gags, Harold is flung out of a moving streetcar, into the middle of a fairly busy road. He was ejected because he’d made himself an irritant onboard the car—overloaded with groceries and a live turkey he just won in a raffle. Now he’s sitting on the road, parcels strewn around him, half dazed. Cars bearing down on him. And the first thing he does is pin the turkey between his legs to keep it from wandering away while he fixes his necktie. Harold’s not a practical man, but he always wants to do the proper thing, and he’s earnest about it. Almost all of Lloyd’s characters are variants of this Harold: normal guys, dreaming of making good by being good. 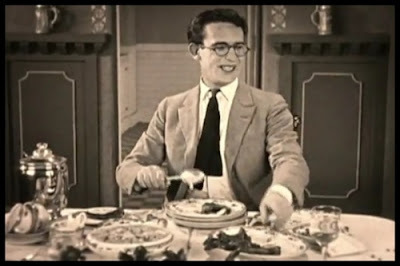 This one’s modest, but admirable goal is to please ‘Wifey’ (Jobyna Ralston), the sweet woman he fell in love with on sight. The grocery-thing’s a pain, the turkey-thing too, the streetcar most of all, but Harold’s still giddy because he’s coming home to her. Plus, he’s got a surprise: a brand-new car. It’ll be there by the time he arrives. Only 59 more payments and it’s theirs. All Harold wants to do at that moment is take Wifey for a drive. Maybe a picnic too—some modest celebration of their domestic achievement. But when he arrives home and embraces her, he sees his pipe in the wastebasket; sees a plume of cigar smoke forming over the back of an armchair; feels a spitball connect with the back of his head. His mother-in-law and brothers-in-law (one adult, one a child) have shown up. These are the tell-tale signs, and so Harold resigns himself, because all three of them are just awful. If the scene on the road best illustrates Harold, this scene, in the livingroom, best illustrates Hot Water’s comic philosophy. Harold navigates his world by means of the clues it provides—the spitball implies the boy, for example—but he’s a linear thinker, uncreative and too naïve, and it gets him into trouble. 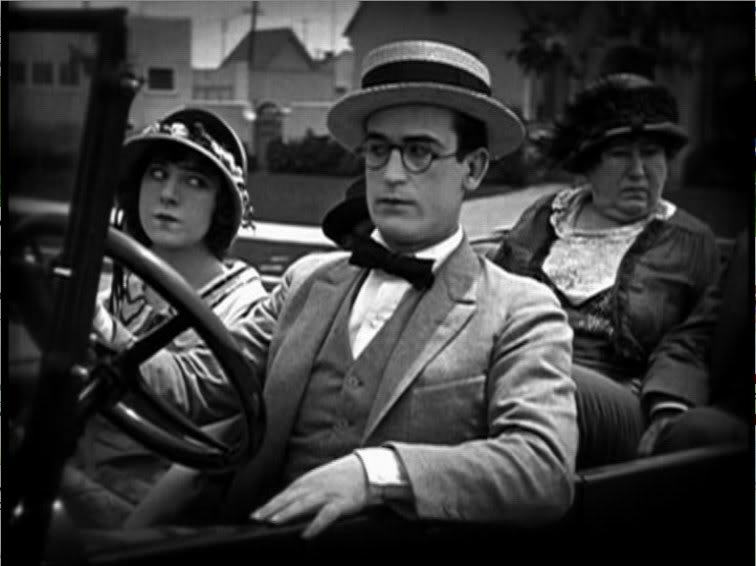 In the film’s second, longest, and best gag sequence, he takes the four relatives for a joy ride in the new car, slowing down initially when he hears the sound of a motorcycle behind him. When it pulls up alongside, Harold sees it’s a civilian, not a cop, and so he speeds again. You can guess what happens next. Harold’s literalism contributes to another odd joke I kind of liked. Up ahead, five WWI vets, probably tipsy, are headed to a benefit. One of them loses his doughboy-style helmet, which lands on the road. Moments before, Harold was scolded by a traffic cop to always drive around traffic buttons: metal knobs on the road, like speed bumps, that look like the soldier’s helmet. Predictably, the helmet falls in an awkward spot, forcing Harold to drive around it and on to someone’s lawn. Which is stupid, but—I can see someone doing this, especially behind the wheel. Traffic is all about rules, and sensible drivers do silly things when forced to adapt. Harold is an average an facing fairly plausible obstacles, which is what makes Hot Water is so charming. It’s also why the third gag sequence, in which Harold gets drunk, chloroforms his mother-in-law, believes her dead from it, then spends the last 20 minutes of the film running from the police (who aren’t after him) and the woman’s ghost (she sleepwalks actually, which he should know), doesn’t entirely work. Oh, it’s funny enough; especially Lloyd’s understated routine of a drunken man who knows he’s drunk and desperately wants to hide it, lurching toward the dinner table like his legs are braced and fumbling with the mashed potatoes. And Josephine Crowell’s awfully game as the mother-in-law—almost 80-years old and still willing to be dragged across a room by her foot. Funny, yes, but I couldn’t see it happening to me. And the genius of Lloyd’s comedy was that you could. After all, you’re just trying to do the right thing too, most of the time, in a world filled with expectations and obligations. You don’t want to hurt anybody, or overturn the order of things—you just want to understand them, and maybe fit in. And every once in a while, just like Harold, you have an incredibly unlucky day: so unlucky that it’s almost a joke; so ridiculous that the joke’s worth telling. Well, Hot Water, at one hour, is a movie worth seeing, and for the same reasons. For the first 40 minutes, it may even be one you can’t miss. Hot Water was screened as part of the Toronto Silent Film Festival on April 6, 2011. The film is also available on Disc Three of the Harold Lloyd Comedy Collection, distributed by New Line Home Video. Thank you. That's a good analysis of Harold Lloyd's appeal. "Hot Water" is one of his features that does not get enough attention. I saw this years ago at a theatre where Robert Vaughn did the organ accompaniment. The last 15 or 20 minutes had the audience in hysterics, helped by the brilliant accompaniment. I have never heard any audience laugh so loud so continuously in any movie before or since.